Yesterday was all about my Jersey Boy. We drove to the beach at New Buffalo, then a late lunch at The Stray Dog, and then to The Four Winds to play a few games (Rich...poker, me...penny slots). It was a wonderful day followed by another Classic Movie Night here at the CS2 theatre. I'm a book girl. (At least this is the excuse I gave JB for not seeing any of the more iconic films). He was uttely appalled, so in an effort to culturize me, we watched Casablanca on Friday night (I fell asleep and had to rewatch it again Saturday morning), and last night we watched From Here to Eternity. At the moment I await his return from Mass. I opted out this morning in an effort to stop feeling quite so unwell, and now that I've rallied a bit we're off to brunch. Today will be my day to sit in the Happy Chair and stitch. I hope to continue with the Ink Circles piece, but who knows where the day will take me? Happy Sunday, Dearies! Hope you are equally as content and that your needles are flying! I identify with the 'book girl' thing. Hope your day is full of joy!!!! Cute shoes. Are they comfortable for walking? Hi, Carol! Yes, they are indeed! 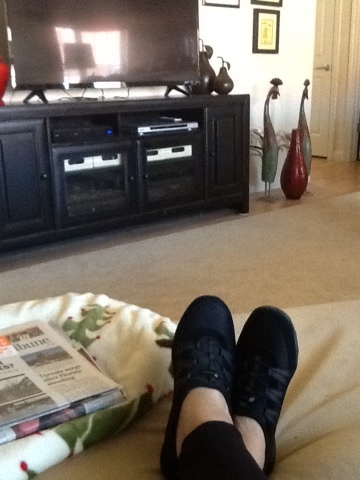 I got them at the Targets...my first pair of black sneakers! the day and all its activities with JB.. Sounds like a great day. I love the clothes and outfits in the “old” movies. Three of my favorites are three coins in the fountain, to catch a thief, and doctor Zhivago. Take care and have a great one! I think Casablanca is way overrated. For one of my fave Bogart performances, see him with Bette Davis in The Petrified Forest (1936). Give it a whirl! I also like books and wonder what you're reading that you're enjoying. With Poldark on the PBC, I've been reading the series and find them light and entertaining. I also enjoyed The Faraway Horses, The Road from Coorain, Where'd You Go Bernadetta and Watership Down. What does anyone else recommend? I am currently reading Rebecca,and will watch the 1940 movie with Laurence Olivier and Joan Fontaine after I finish the book. Sounds like fun Coni....I've been to Four Winds a few times myself, it's a nice place. I used to be a real bookworm until I got married and since then (27 yrs) I haven't had nearly the time I want to read. I really need to get back to it!